On April 19, CRICS10 was officially launched by Dr. Francisco Becerra (PAHO/WHO Assistant Director) and Dr. Diego González (BIREME/PAHO/WHO Director). The virtual session was attended by professionals from PAHO/WHO Headquarters, country Offices and network members such as the VHL Network, LILACS, RedDes, as well as other partners of BIREME. The introduction speech delivered by Dr. González highlighted the objective of the CRICS series since 1992: contributing with the PAHO/WHO Specialized Center’s mission of democratizing health information, evidence and knowledge in the entire Region. “On this occasion, we have aligned ourselves to one of the current global priorities, the 2030 Agenda and its Sustainable Development Goals. Thus, technical discussions held during the Congress will revolve around this theme, especially since the Region of the Americas has been a pioneer in launching its own Sustainable Development Agenda for 2030, and information, evidence and knowledge are its transversal axes”, he remarked. The BIREME Director also noted that CRICS10 will be preceded by the 7th Regional Coordination Meeting of the Virtual Health Library (VHL7), as well as other satellite events such as the Scientific Editors’ Meeting, IV Meeting of the VHL Development Network and Associate Networks (RedDes), Workshop of the Open Educational Resources Network of the Virtual Campus of Public Health (REA CVSP), Meeting on the use of information technology applied to the strengthening of Primary Health Care: experience in the Region of the Americas, and PAHO/WHO Meeting of Knowledge Management Focal Points – K-Centers. Dr. Becerra pointed out the contribution of CRICS in the field of health information in the Region and the relevance of the theme centered on the 2030 Agenda, organized in seven thematic areas: Knowledge Management; Innovation and Digital Health; Information Management; Research and Scientific Communication; Politics, strategies and decisions informed by evidence; Open Science; and Intersectoral. The organization of the Congress is supported by specialists and representatives of the institutions that act as a network along with BIREME, organized in four committees: Honor Committee, International Organizing Committee, National Organizing Committee and Scientific Committee. 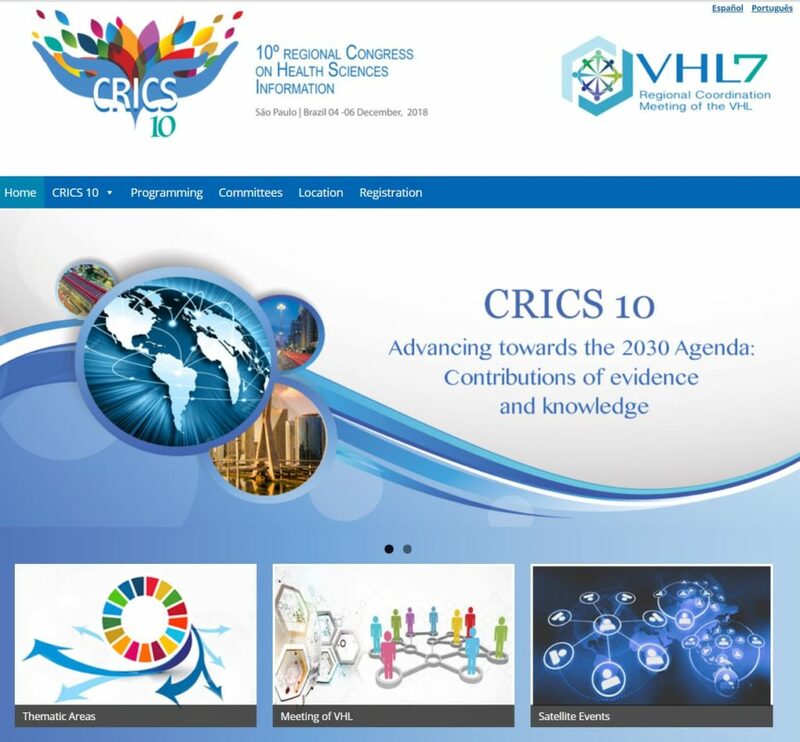 CRICS was created as an innovative congress in the field of scientific information, knowledge management, methodologies and information technologies and its applications for the development of research, education and health care systems. It is one of the most important and consolidated forums on scientific and technical health information, providing a space for the discussion of relevant issues regarding the production and access to information that is pertinent to Public Health in the Americas.